Pumpkin, cinnamon, ginger, nutmeg, maple syrup, and a hint of vanilla are combined into this moist tart that melts I your mouth! Great for using up those cans of pumpkin puree leftover from Thanksgiving! To make the crust, grind the walnuts with a few tablespoons of the flour in a food processor fitted with a metal blade until finely ground. The flour will keep the nuts from turning into paste. Transfer to a medium bowl, add the remaining flour and the baking powder, and whisk to combine thoroughly. In a small bowl, whisk the oil, milk and a pinch of salt. Add to the flour mixture, stirring until the dry ingredients are completely moistened. Press the crust into an oiled 9-inch tart pan. Placing a piece of plastic wrap between your fingers and the dough will facilitate pressing. Press the last few times with your thumb around the sides where the bottom of the pan meets the side to make sure there is no excess crust there. Use a knife to cut off any excess along the top of the tart pan, then poke holes all over the crust with the tines of a fork. Bake the shell for five minutes, then remove from the oven and set aside. Do not turn off the oven. In a large bowl, combine pumpkin puree, eggs, maple syrup, milk, vanilla and salt. Pour into tart shell. Bake about 50 minutes or until set, checking tart after 30 minutes and tenting edges if browning too quickly. Transfer tart to a wire rack to cool for an hour before transferring to refrigerator to cool completely. Head on over to Earth Mama Angel Baby to take advantage of four great printable coupons! Good through December 31st, 2010, you can print yours out here and take them with you to any participating retail store. Pour some hot chocolate, stoke the fire, and snuggle up on the couch with Frosty the Snowman, Rudolph the Red-Nosed Reindeer, and Santa Claus! The Original Christmas Classics have made their debut on Blu-Ray+DVD this holiday season! If you look forward to these Christmas classics on TV every year, now you can enjoy them over and over again with your family. The iconic special, which first debuted in 1970, tells the story of how Santa Claus and several honored Christmastime traditions came to be. These stories really take you back to your childhood – “Mom” especially loved watching the journey of Frosty the Snowman again as he tries to reach the North Pole before he melts. The box set contains four of the most beloved holiday TV specials of all time, including the Rankin/Bass classics “Frosty the Snowman,” “Rudolph the Red-Nosed Reindeer,” “Santa Claus is Comin’ to Town” and “Frosty Returns.” It’s the first time any of them are available on Blu-Ray, and wow – what a difference! For the movie buff or kid-at-heart on your gift list, The Original Christmas Classics Box Set is a must-have this season! 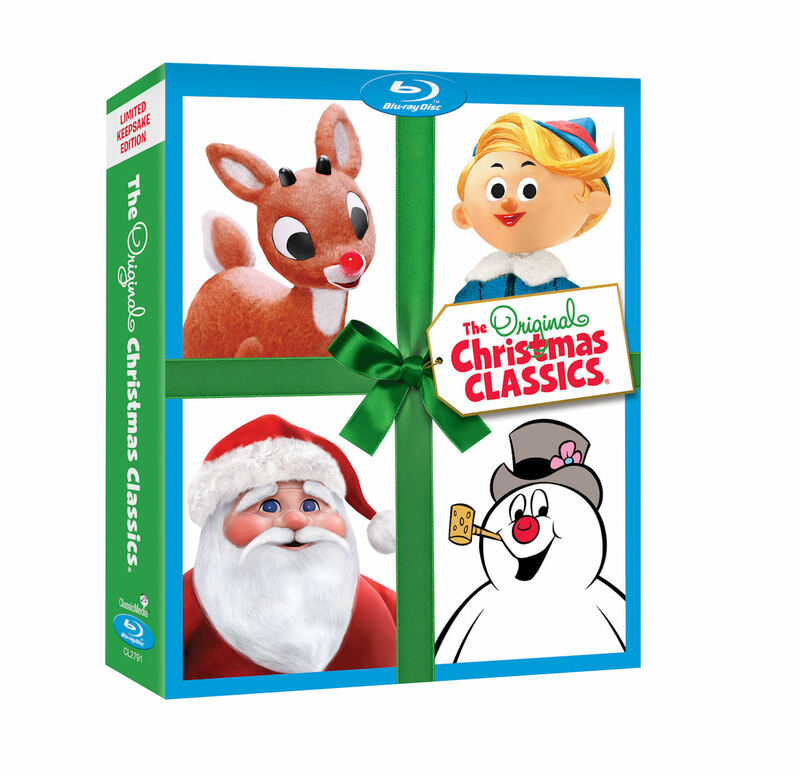 The Original Christmas Classics Box Set is available wherever Blu-Rays are sold for $44.99. Utilize the fruits of the season with this fresh green salad featuring grapefruit and dried cranberries! Served with a tangy vinaigrette made from grapefruits, it can be made ahead up to two days – a huge plus when preparing those busy holiday meals or your next dinner party. Whisk oil, scallions, vinegar, salt and pepper into the bowl with the grapefruit juice. 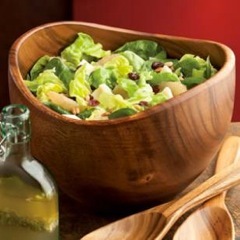 Add lettuce, spinach and hearts of palm to the salad bowl with the grapefruit segments. Just before serving, toss the salad with the dressing until well coated. Sprinkle cranberries and pine nuts on top. Drizzle with your favorite FruitFast® Liquid. FruitFast® is the world’s exclusive producer of whole fruit softgel capsules including CherryFlex, Wild BlueberryIQ, Wonderful Pomegranate, and the newest product in the FruitFast line – CherryFlex ProSport Shots. The functional food company Brown Wood Acres also produces a variety of fruit supplement liquids, concentrates and bars made from 100% fruit. Chef Kate McAloon has done it again! These delicious baked oysters are the perfect thing to start off a romantic evening. They take very little time to assemble and even less time to bake. Always use organic ingredients when possible. Enjoy! Mix all the ingredients together well except the oysters and set aside. Carefully *open oysters and set the bottom shells with the oysters in them on a bed of rock salt in an oven proof baking dish. You can also have your fish monger open them for you. Use them as soon as possible once opened. Put about a Tablespoon of the stuffing mixture on each oyster so that the entire oyster is covered. You can prepare them to this stage and keep them in the refrigerator for a half hour before baking. Bake the oysters for 6 to 8 minutes or until the bread crumb mixture becomes a little golden brown. You can also pop them under the broiler for a little less than a minute to finish browning them if needed. Watch them to make sure they don’t burn. 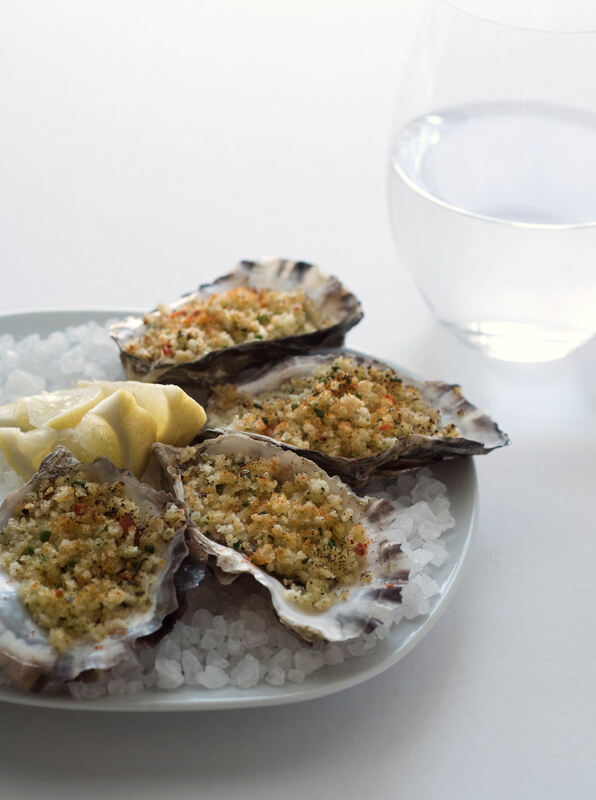 Remove the oysters from the oven and carefully set them on a plate with more rock salt. Serve with lemon wedges and a glass of Champagne. *This recipe was recently featured at www.koraorganics.com. Oysters courtesy of Maitre Escailer (Shellfish Specialist) Christophe Happillon www.oystergourmet.com. Check out their website for details on where to get great sustainable oysters and how to open them, as well. Images by: Lauren Lemons. You can see more of her work at www.laurenlemons.com. 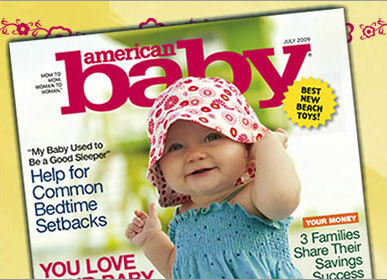 Treat yourself to a FREE subscription to American Baby Magazine this holiday season! Click here to take advantage of this special offer! http://tinygreenmom.com/wp-content/uploads/2018/07/logo-sm.png 0 0 Tiny Green Mom http://tinygreenmom.com/wp-content/uploads/2018/07/logo-sm.png Tiny Green Mom2010-11-27 13:55:342010-11-27 13:55:34Free Subscription to American Baby Magazine! Adorable Stocking Stuffer Giveaway from bINK’d! 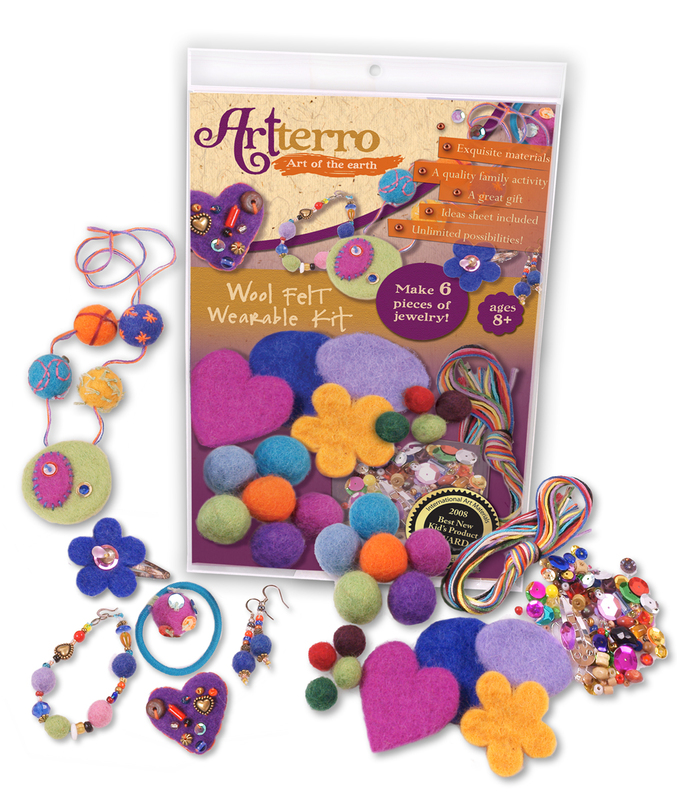 Cute stocking stuffer alert! 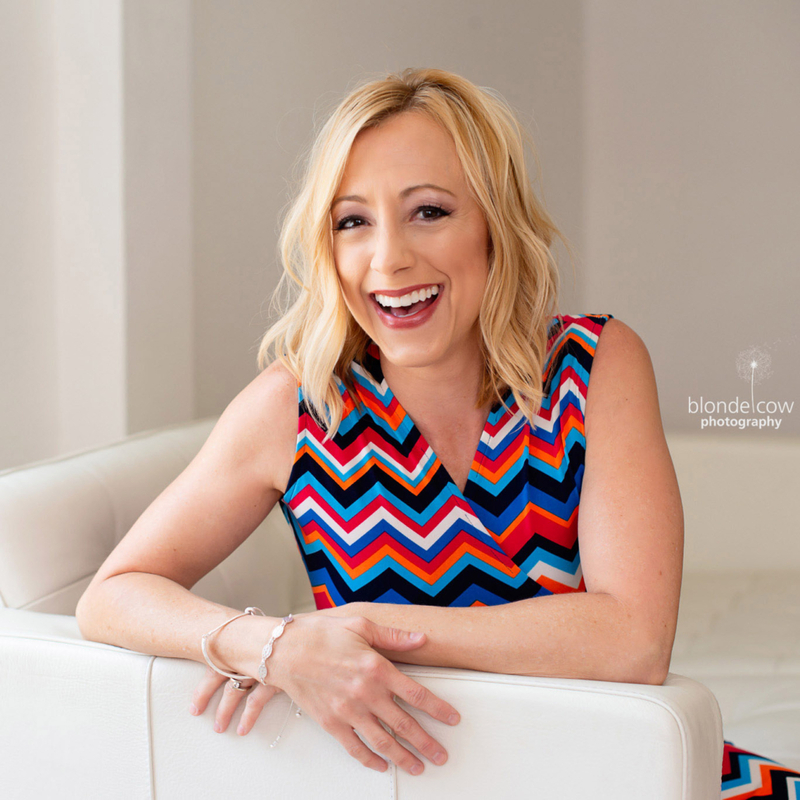 Created by mom entrepreneur Cara Rybarik, bINK’d Temporary Tattoo Earring Designs are simply adorable kid-safe, FDA-approved temporary tattoos made of vegetable-based inks and adhesive. Available in twelve fun designs for both boys and girls, plus new Glitter and Holiday Designs to add a festive touch during the season, each bINK’d can be worn for up to 7 days! Each durable stackable container contains 12 of each design, and bINK’d temporary tattoos can adorn not only ears, but fingernails, toenails, books, a baby doll’s ears – let your little one decide! bINK’d – Not forever. Just for now! To purchase bINK’d Temporary Tattoos, visit www.binkdkids.com. First, please tell us why you would like to win a set of bINK’d this holiday season. The bINK’d Temporary Tattoos Giveaway ends on Sunday, December 5, 2010 and is open to the US and Canada only. Please leave your email address in each comment, and make sure to leave a separate comment for every each and every entry that you make so that they will count for you! The FIRST 25 Tiny Green Mom readers can score a FREE container of bink’d temporary earrings with ANY purchase of Bink’d earrings! Just click here and purchase 1 container which contains a strip of 12 bink’d temporary tattoo earrings (that’s 6 pair) for $5.95 + shipping, write Tiny Green Mom and free design choice in the note to seller section (will be an option while paying), and you will automatically receive a second container of bINK’d earrings with your order FREE (buy an original design and get a GLITTER or GLOW free to maximize savings). Shipping is around $1.40. Be sure to check out BinkdKids.com to view the exciting ways others sport their bINK’d ear fun! And watch for seasonal offerings, such as Bunnies, Pumpkins, Penguin, Christmas Trees, as well as GLOW designs! 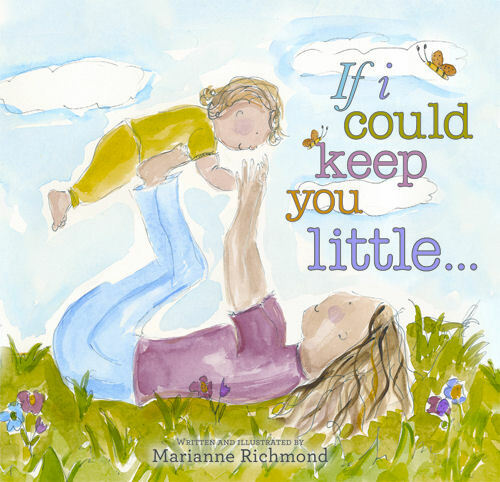 http://tinygreenmom.com/wp-content/uploads/2018/07/logo-sm.png 0 0 Tiny Green Mom http://tinygreenmom.com/wp-content/uploads/2018/07/logo-sm.png Tiny Green Mom2010-11-27 13:31:552011-04-12 11:03:26Adorable Stocking Stuffer Giveaway from bINK'd! Some eco-cool finds on Ecorazzi’s 2010 Holiday Gift Guide. 14 Green Toys and Gifts: 2010 Eco-Friendly Holiday Guide on EcoChildsPlay.com. Inhabitat Green Gift Guide 2010. Green Ideas for Everyone on Your Gift List on TreeHugger.com. Here’s a healthy and fun way to use up some of those leftover cans of pumpkin that didn’t make it into the pie at Thanksgiving! 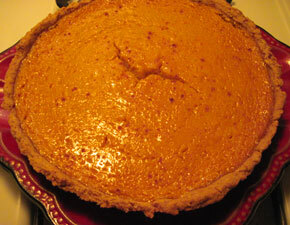 In a large bowl, whisk together the flour, whole wheat flour, baking soda, baking powder, pumpkin pie spice, and salt. In a medium bowl, mix together the buttermilk, pumpkin puree, egg yolks, brown sugar, and melted butter. Add the wet ingredients to the dry ingredients, mixing until just combined. In a clean medium bowl, beat the egg whites until soft peaks form. Gently fold the egg whites into the pancake batter. Gently fold in the granola. Spray a griddle or a large skillet with nonstick cooking spray and place over medium heat. Working in batches, pour the batter by 1/3-cupfuls onto the griddle. Cook the pancakes until bubbles start to form on top, about 2 minutes. Carefully turn the pancakes over and cook until the bottoms are golden brown, 1-2 minutes more. 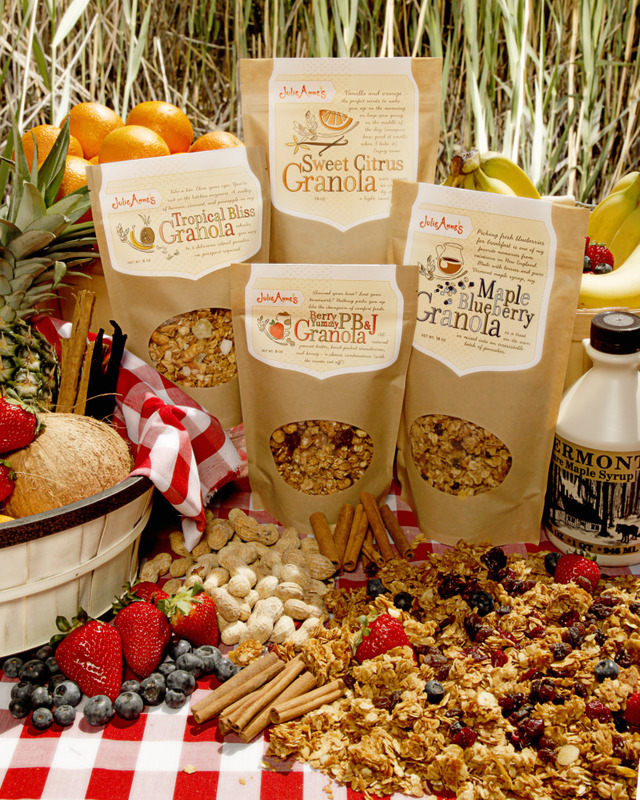 Transfer the pancakes to plates and serve with pure maple syrup and a sprinkle of granola.